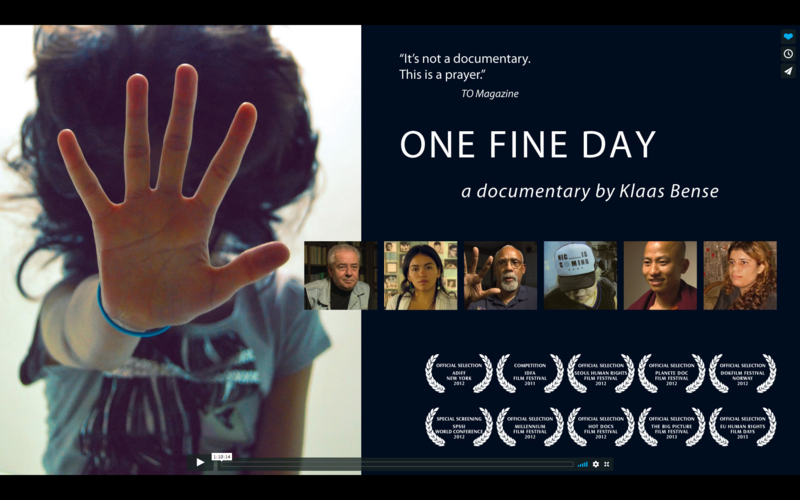 The documentary One Fine Day, shows six people from different cultures and religions who all, through a small nonviolent act, have had a significant and positive influence on society. In the film we meet a young Burmese monk, a Chilean student, a German priest, a young Iraqi woman, an American former athlete and a Chinese youngster. In One Fine Day director Klaas Bense investigates how frustration can be turned into positive actions. He looks at what one single individual can achieve, and the often severe, personal consequences. For this documentary I did some compositing and retouching and the conforming on the Nucoda for the grading. The conforming part was especially challenging since a great deal of this film was made using archive footage. all kinds of video formats and standards were mixed together. My job was to recreate the film with the online footage and make it look as good as possible. Converting and up scaling using all kinds of techniques. I work together with Hans Loosman on this production. Proud to announce the release of Echo! Copyright © 2019 Gregoire Verweijen | Compositing & Visual Effects.